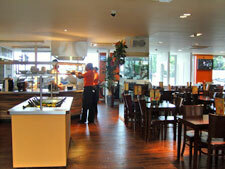 Sound Division supply advanced multimedia for new Stratford restaurant. 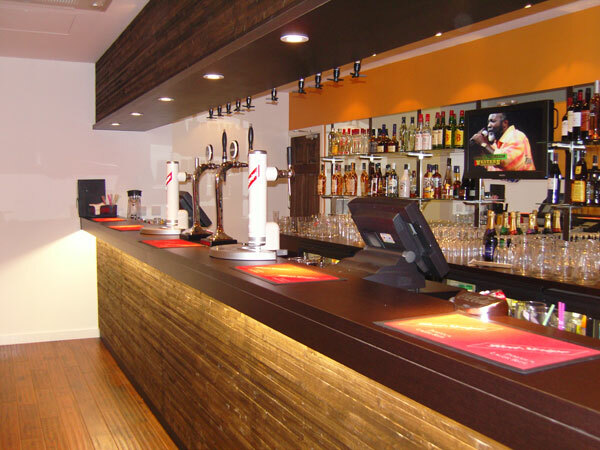 Having last year provided an integrated multimedia system for Caribbean Scene’s first restaurant in the shadow of the ExCeL Exhibition and Conference Centre, the Sound Division Group have travelled from Docklands to Stratford to complete a similar design on a much larger footprint for the second restaurant. The irony is that set on a massive 5,200 sq. 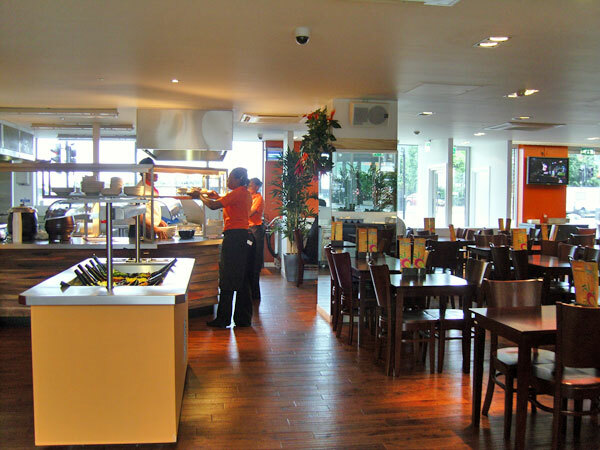 ft of prime real estate, the new Caribbean Scene Family restaurant, had originally been earmarked as the pilot venue from as far back as April 2003, until red tape delayed the project. However, by early this year the developers were on site, and £750,000 later it has been fitted out to an extremely high standard. Peach Projects, led by Emily Chan, were the architects and main contractors, and for the media distribution The Sound Division Group adopted a similar model to the Royal Victoria Dock restaurant with the exception of the speakers — which this time are exclusively Martin Audio AQ architectural series. The AQ range has been conservatively styled to be largely unobtrusive, in an ultra-compact package. Designed to cater for the industry standard first and second fix installation method, the AQ Series was engineered for just such an application as this. 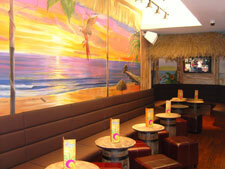 Designing the system into eight zones David Graham’s company has provided sufficient audio and visual relays to guarantee an authentic Caribbean atmosphere across the 200 cover restaurant, as well as the separate tiki cocktail bar, the thatched live performance area at the far end and the dedicated takeaway kiosk. While special Caribbean promos feed the four Panasonic 42in plasma displays from DVD images (Denon DNV100) from around the Caribbean, an MP3 player pumps reggae and calypso music into the colourful interior, the design of which has again been masterminded by Patrick Marché’s wife, Valerie, to reflect the sights, sounds and atmosphere of the Caribbean. For the high-performance areas (such as the stage and main restaurant area) SDG have used a flown multiples of AQ8 enclosures, with a pair of AQ210 (dual 10” subs) adding LF extension for DJ’s and artistes performing on the stage. The powerful system will further come into its own later once set areas can be delineated via a partitioning wall, for VIPs or for private corporate hire. 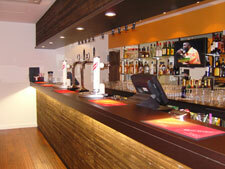 Elsewhere smaller AQ5 and AQ6 background speakers adorn the take away and Bar/Lounge areas respectively. To create infinite flexibility the installers have provided plug-in points for DJ’s and a retractable Soundcraft MFX8 mixing desk on a concealed tray, while all the DSP is stored in a BSS Soundweb BLU10 DSP environment touch panel, with local remote access from behind the greeter station. A highly specified but simple to operate video switching and playback system has been installed consisting of a Kramer 8x8 matrix switcher, and two Denon DNV100 professional DVD players. To complement the plasma screens Sound Division has also installed a Sanyo WX3013 3700 Ansi Lumen projector— and an electric drop-down projection screen , to make the restaurant space instantly convertible for business use. In addition several VGA plug in points have been installed for Powerpoint presentations, and to facilitate smaller breakout group meetings. Patrick Marché says he is delighted with the installation and the overall audio quality. “David Graham recommended the Martin AQ loudspeakers which both sound good and are sufficiently stylish to fit within the design aesthetic,” he said. In response MD David Graham commented “I am pleased to say that this second installation for Patrick has really gone smoothly with the client agreeing the design and specification and letting us get on with the job !. The system looks and sounds great, which has instantly created an attraction with drawing in customers to eat and drink, which has already started to prove the investment made”. The restaurant itself is open seven days a week, and offers an atmosphere of escapism and relaxation for its diverse East London clientele. The menu offers a taste of traditional and contemporary Caribbean dishes including Jerk or BBQ Chicken, Oxtail Stew and sharing platters. Situated close to the Theatre Royal Stratford and Playhouse Cinema it occupies an excellent location. “This is already proving to be a good meeting place — for people of all cultures,” says Patrick Marché. He is hopeful that Caribbean Scene Family will provide him with a roll-out brand once the economic conditions become more favourable.